This is Andrew's handling of Roy Walton’s “The Collectors” plot. 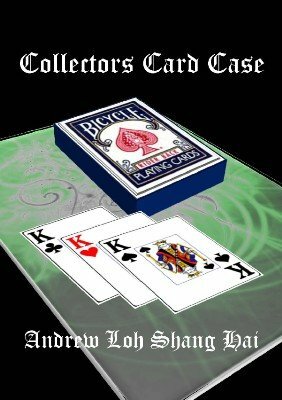 If you are familiar with his original plot, here, the magic moment takes place in the card case and it has served Andrew well over the years. He developed this handling while he was playing a number of “The Collectors” effects during the afternoon in the year of 2006. Effect: The performer places three Kings in the card case. The performer then proceeds to have two spectators to freely choose two cards from the deck. The two selections are signed and lost in the deck. The performer waves his hand over the card case and magically, one of the Kings appears face up on top of the deck. Another gesture, the King disappears and the performer claims that he sends the King back into the card case. The deck is spread and the signed selections have vanished in the deck. The spectators may inspect the deck that their signed cards have indeed vanished. The card case is opened and the content is removed, two face-down cards are trapped in between the face-up Kings. The performer concludes the routine by revealing the face-down cards which happen to be spectators’ signed cards. Best of all, the signed cards can be given out as souvenirs. You end clean.